This page will share partition software with which you can expand size of C drive when Diskpart cannot extend it on Window Server or free on Windows PC. 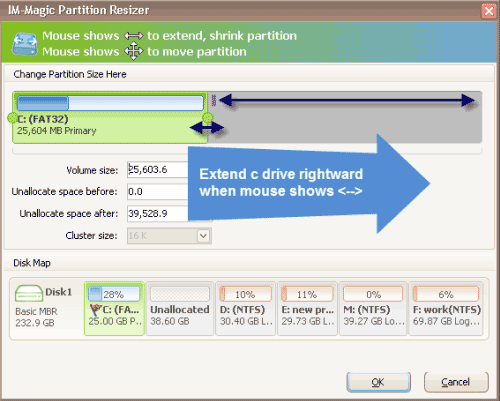 Download IM-Magic Partition Resizer Server for C drive resizing when Diskpart failed on Windows 2003 2008 2012. Do you know that Diskpart has the ability to extend partition? However, Diskpart cannot extend a system partition and an FAT32 partition. If you want to extend C drive system partition, you can use the freeware - Partition Resizer, which is a 100% freeware to extend c drive on Windows 10/8.1/7. IM-Magic Partition Resizer Server, this partition software functions as magic to resize disk partition whether it is system partition or data partition. This partition software can work on Windows Server 2003 2008 2012, SBS 2003, SBS 2008 and Windows Server R2 to help extend C drive when it is running out of disk space. "The C drive on my PC has extremely low disk space. My PC has Windows Server 2003 operating system installed and the total capacity of C drive is about 40GB. I do not know why but the C drive contains about 29GB data inside. The problem is that I have never saved any data or installed programs on the C drive. I don't know if I can delete the files stored on the C drive, but I want to fix the low disk space problem as soon as possible. I tired to run Diskpart command to extend C drive, but it failed. Please help me fix low disk space on Windows 2003 C drive." "My computer with Windows Server 2008 system frequently reports low disk space warning on C drive. I have deleted some unnecessary files and also uninstalled some applications, but the system still reports the warning message. I need your help and please give me tips to free up disk space on C drive." Can Diskpart Extend C Drive on Windows Server? It can only free up little space by deleting unnecessary files, so system still reports low disk space warning message even if you have deleted some files from C drive. 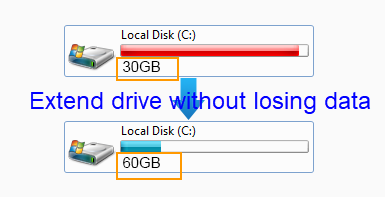 If you want to fix the low disk space problem thoroughly, you can increase the size of C drive. It is true that Diskpart command can extend a partition on Windows Server like Windows 2003, 2008, 2012, etc. However, the unfortunate thing is that Diskpart cannot extend a system partition and FAT32 partition. Therefore, you might receive the message to say that the selected drive cannot be extended when you run Diskpart command to extend C drive. When Diskpart failed to extend C drive, you can use the partition software which is able to resize hard disk effectively and efficiently. As professional partition software, IM-Magic Partition Resizer Server can extend C drive system partition and data volume. This partition software also enables you to resize partition in VMware on Windows Server. You need to move free space from other partition to extend C drive, and you can only move free space on the same hard disk. If RAID 5 is running out of disk space, you can add one or more disks to extend the RAID 5 array. However, the new added disk will show as unallocated space behind the RAID 5. If you want to add the unallocated space to RAID 5, you may need to rebuild array. Now, with the partition software, you have no need to rebuild array and you can easily add the unallocated space to the RAID 5 array. You can also use this partition software to add the unallocated space to C drive on RAID 5. If there is existing free space on the RAID 5, you can directly move free space from other partition on the RAID 5 to increase the size of C drive. You can use partition magic Server free to extend C drive in RAID on any Windows Server operating system without rebuilding the array or deleting any data.